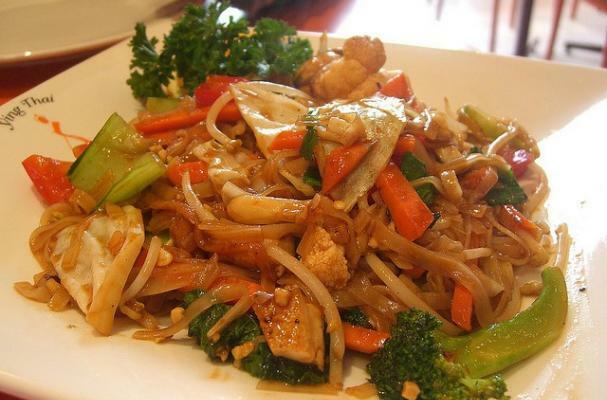 Pad thai is probably the most popular Thai take out dish. Rice noodles are tossed in a sweet, salty, and tangy sauce with peanuts, bean sprouts, scallions, and meat or tofu. This vegetarian pad thai recipe can be made in 30 minutes and doesn't require too many exotic ingredients. You should be able to find everything you'll need in your local Asian market. Feel free to substitute the tofu with tempeh, shrimp or even chicken. Vegetarian pad thai is a delicious way to shake up your culinary routine. Combine first four ingredients and let sit until sugar dissolves. Soak rice noodles/sticks in warm water until they are soft but don't disintegrate when pressed, about 40 minutes. Drain. Drain tofu by wrapping it in a clean towel and pressing with a large can of tomatoes, about 30 minutes. Cut into 1/4 inch cubes. Rinse dried shrimp (if using) in water and drain. Put oil in wok, heat to medium, put in crushed garlic. Swirl around for about a minute. Add noodles and mix around for a minute or two. Add the tofu and shrimp then immediately add the liquid. Keep stirring until the liquid has all been absorbed into the noodles, about a couple of minutes. Lower heat to low or medium-low. Push some of the stuff aside at one end of wok, and break an egg in. Immediately cover with noodles. Do the same at the other end of wok. Let the eggs cook undisturbed until the yolks are practically cooked, about three minutes. (Carefully peek if unsure.) Slip a slotted spoon under each egg in turn, and bring upward, through the noodles, shaking as you go. The idea is to break up the cooked egg into the rest of the mixture into tiny bits. Mix in sprouts and green onions. Let cook for another two minutes. Turn off heat. Add crushed peanuts and enough roasted red chilies to your desired hotness. where's the liquid measurement, and what is it?! !